« Update on Encouragement: She passed! Published May 24, 2013 | By Jennifer K.
On this day the Misbah family begins their Citizenship studies here at Hartford Public library. 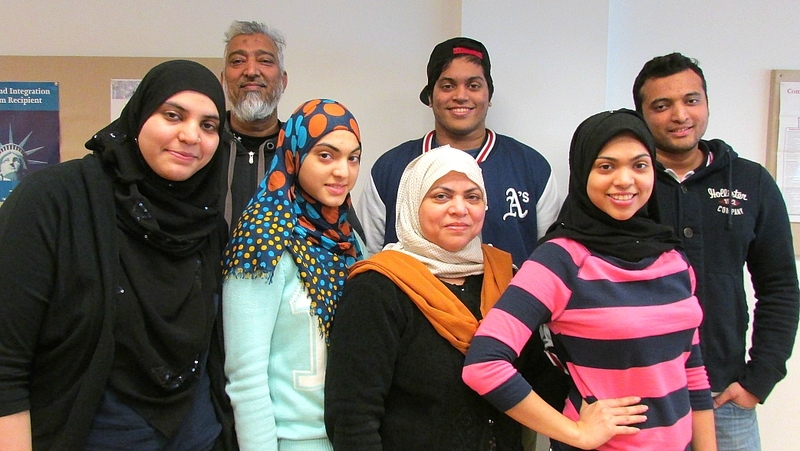 There are seven in the family: parents Syed and Nailah and their five children, Saqlain, Nimrah, Mumiza, Syed Jr. and Moniza. They shuffle in and wait patiently for class to begin. I walk over to welcome the oldest son, Saqlain and the family. I’m excited they’ve come. I know today is a special day for them as it marks another important step towards their citizenship, an accomplishment for each of them individually but with greater significance as a family. The Misbahs have worked hard since arriving her from Karachi, Pakistan in 2008. They were all formally educated in their native country, and the children studied English so they all had a basic language foundation when they arrived here however not enough to not need English classes when they got here. The younger siblings enrolled in the public system and have only a slight hint of an accent as they arrived here at a younger age. The older siblings enrolled in more intensive ESL classes at Capital Community College to study English. The Misbahs hope­­­ for a better life here in America. Besides the freedoms this country gives them, they want the right to vote. They are excited to participate in the next election. And as much as they want to contribute their ideas and their vote, they want to pay taxes and becoming contributing members of the United States. They know that doing so will allow them the opportunity for medical care, social security when they retire, and scholarships for their education. They want the opportunity for better education and em­­­ployment. Already all four children are enrolled in college, Saqlain’s younger siblings are all full time students at Capital Community College and Saqlain has just graduated with a degree in industrial technology with a minor at business from Central Connecticut State University. When I talk to him, he cannot contain his excitement for his new job working as an IT Engineer at the Travelers. They all have higher aspirations- aspirations that would be difficult if not impossible to achieve in their native Pakistan. Syed, Sr. holds two degrees in mathematics in Pakistan. After achieving citizenship, he hopes to become accredited to teach mathematics here in the United States. The young Misbah women are strong and determined. This much is clear the moment they start talking. They are full of energy and enthusiasm. I ask them how classes are going and they all respond in a simultaneous echo, “incredible!” They are all excited to have learned so much about American civics, and to be entering this new place in their lives. But they are sad to be losing their citizenship to Pakistan, especially Nimrah, the eldest of the three daughters. I ask their mother Nailah how she feels; she smiles in assignation, acknowledging all the freedoms and opportunities available to she and her family with American citizenship. I can tell she is excited and hopeful, and so am I. I look forward to following them on their path towards citizenship. More to come!